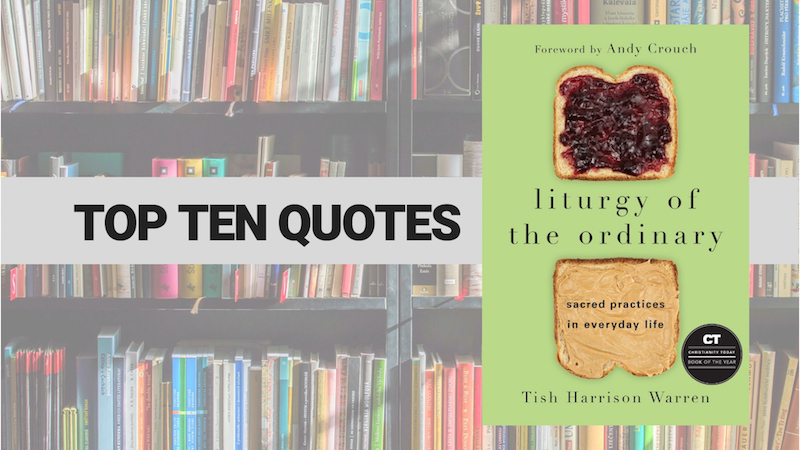 I tackled Tish Harrison Warren’s Liturgy of the Ordinary: Sacred Practices in Everyday Life as a part of my summer reading list. I’ll admit: some of the books on that list were difficult to work through and took a little more effort. Liturgy of the Ordinary was not one of those. Warren served up multiple reminders that the stuff of our daily lives serves to point us back to Jesus, and that there are no wasted moments that he can’t redeem for his glory. The Word became flesh. The Word went fishing. The Word slept. The Word woke up with morning breath. The Word brushed his teeth—or at least he would have, if the Word had been a twenty-first-century American instead of a first-century Judean. Examining my daily liturgy as a liturgy—as something that both revealed and shaped what I love and worship—allowed me to realize that my daily practices were malforming me, making me less alive, less human, less able to give and receive love throughout my day. I need rituals that encourage me to embrace what is repetitive, ancient, and quiet. But what I crave is novelty and stimulation. We must guard against those practices—both in the church and in our daily life—that shape us into mere consumers. The Christian faith teaches that all work that is not immoral or unethical is part of God’s kingdom mission. Redemption is crashing into our little stretch of the universe, bit by bit, day by day, mile by coming mile. We have hope because our Lord has promised that he is preparing a place for us. We are waiting, but we will make it home. Christian friendships are call-and-response friendships. We tell each other over and over, back and forth, the truth of who we are and who God is. …if we never savor a lazy afternoon, if we must always be cleaning out the fridge or volunteering at church or clocking in more hours—we’ll forget how to notice beauty and we’ll miss the unmistakable reality of goodness that pleasure trains us to see. …embracing sleep is not only a confession of our limits; it is also a joyful confession of God’s limitless care for us. For Christians, the act of ceasing and relaxing into sleep is an act of reliance on God. Order Liturgy of the Ordinary.